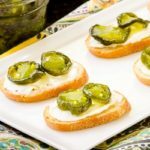 Candied Jalapeño Cream Cheese Crostini is a fantastic appetizer for your next party. It's crunchy, creamy, hot, sweet, and totally tasty. Drain and discard juice from the jalapeños. Place jalapeños in a small bowl. Add sugar, lime zest, and lime juice. Stir to combine. Cover and chill for a minimum of 48 hours or up to 1 week. Stir twice a day while chilling. Note the sugar will eventually melt and turn into liquid while chilling. Cut baguette into 1/4-inch slices. Place slices on baking sheets. Brush slices with olive oil. Sprinkle with salt and pepper. Bake until golden brown and crispy, about 10 minutes. Transfer to a wire rack and cool completely. Option 1: Set out candied jalapeños, crostini, and cream cheese and let everyone assemble their own. Option 2: Pre-assemble by spreading cream cheese on crostini and top with candied jalapeños. Time stated does not include time for chilling jalapeños (48 hours or up to 1 week).